Will the Oculus bite into oil demand? The London-based investment advisory firm Redburn thinks that global demand for oil could peak around 2026, writes Fereidoon Sioshansi, President of Menlo Energy Economics and publisher of the newsletter EEnergy Informer. The implications for oil majors are ominous.For some time, there has been speculation about when global oil demand may peak – not because we will run out of oil or prices will spike making oil unaffordable, notions that are now considered passé – but because we won’t be needing as much of the stuff as we thought we would. And once the peak is finally reached – whenever that is – demand will begin to drop thereafter, perhaps precipitously. What is radically different about the new thinking about oil demand is that price, while still an important factor, no longer seems as important as it used to be. As further described alternatives to oil are or will soon be cheaper making the price of oil far less significant. Witness the fact that global oil has been growing at much slower clip in the last few years even though prices, hovering in the $40-60 range per barrel, have been at or near historical lows. The old theories that low oil prices result in robust demand growth may no longer apply – and that, of course, would be a radical departure from the historical norms. West identifies 5 major trends, all contributing to intensified market competition and – one might add – potentially devastating consequences for the oil majors. Oil subsidies, once prevalent in many countries – are expected to dwindle or be phased out entirely as already witnessed in a number of countries. Redburn’s fact-filled report offers solid data and analysis of trends backing its conclusions. Whether one believes the results or not, is another matter. Much of Redburn’s narrative, of course, is not new. But this condensed 11 page report manages to bring the facts together and distill a powerful conclusion – namely a prediction that peak oil demand may be a reality much sooner than many in the mainstream are predicting – less than a decade away. For example, there is little disagreement that oil subsidies, once prevalent in many rich and even few non-rich OPEC countries, are being reduced and/or gradually phased out in Saudi Arabia, Indonesia, Mexico, Egypt, Iran – to name a few. Or the use of oil in power generation. In much of the OECD, it is a thing of the past. The same is likely to happen globally. With the price of renewables continually falling, they will increasingly be cost competitive with conventional fossil fuel sources. The accompanying table illustrates the point. Why bother with alternatives when solar generation can be had for around 2-3 cents/kWh? In the US, regular home working has doubled since 2005. 2.5% of the labor force works from home at least half the time. Harvard Business Review describes 13.5% productivity gains from working remotely, plus cost savings of $11,000 per person and a 50% lower likelihood of quitting one’s job. Penn State researchers even found ‘remote workers’ more alert and attentive, attributed to getting 1-hour more sleep per week and not commuting. So if you are reading this note in the office, go home immediately…,” West advises. Regarding electric vehicles, Redburn is simply following what many others have been saying. Some experts are far more ambitious, others less so. And the bottom line is that nobody really knows. 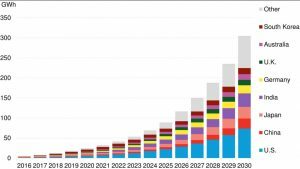 EVs will be displacing c0.1Mbpd of annual demand growth in 2020, 0.3Mbpd in 2025 and 0.7Mbpd in 2030. Having examined the 5 critical trends, Redburn comes back to Economics 101: the impact of price of oil on near term demand. 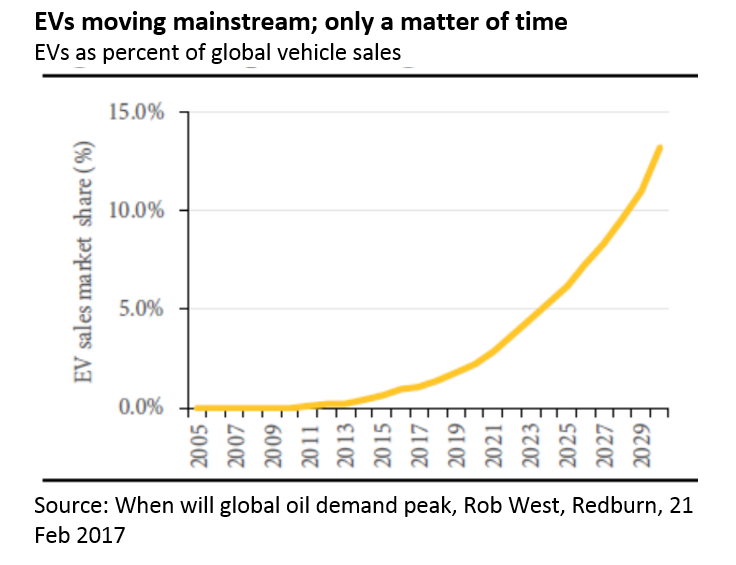 Redburn’s main message is that global oil demand will likely peak around 2026, and that would be without any major inflection in technology. 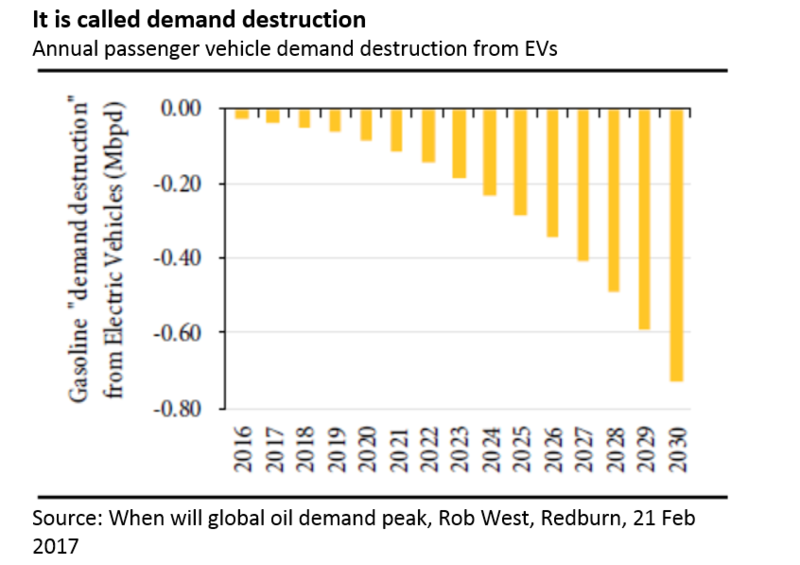 If one assumes an inflection point for electric vehicles (EVs), autonomous EVs (AEVs), solar, energy, storage or other, then the peak may come even sooner What are we to make of this and others who are predicting peak oil demand? 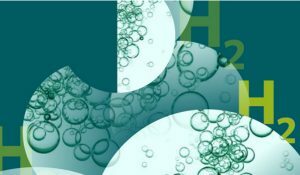 Rob West, a partner in oil & energy research at Redburn believes that given the evidence presented, the implications for oil majors is rather unambiguous. Peak oil demand is coming, it may happen sooner than many expect, and once it arrives, demand for oil may begin to drop – possibly precipitously – something few oil majors have given much thought to in the past. That may begin to change, even though the Trump Administration has proposed to nix the US automobile mileage efficiency standards put in place by the Obama Administration. This article was first published in the April 2017 issue of EEnergy Informer, the international energy newsletter published by Fereidoon Sioshansi of Menlo Energy Economics in the US, and is republished here with permission. To get a subscription to this newsletter, click here. Redburn Report available upon request. 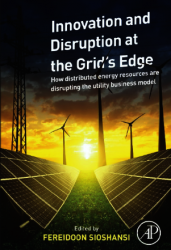 In June a new book will come out, edited by Sioshansi, and published by Elsevier, “Innovation and Disruption at the Grid’s Edge.” It contains articles written by many well-known energy experts from Europe, the US and Australia, on the fundamental transformation taking place in the utility industry. The 600 pound gorillas not mentioned : increasing particle (NOX) pollution worldwide particular India and China which are assumed to be the growing markets for IC Engines and oil. Falling public support for continuing subsidies for the social costs of fossil fuels in Western countries for ICE manufacturers and oil majors. Cities are starting to tax / restrict diesel cars as their driving and non driving citizens struggle to inhale clean air. How long before the public’s subsidized medical costs become an issue for oil majors and car manufacturers as politicians around the world realize the oil tax revenue received is now dwarfed by the health costs paid by the state and public ? Real world testing instead of fantasy laboratory is going to be the norm for IC Engines. India is bringing forward emissions testing to compatible Euro 6 not Euro 5 tests. Piyush Goyal Minister for Power, Coal new and renewable energy has annouced in 2016 the Indian Government are looking at a plan for every car to be electric by 2030. Not a lot of long term growth for oil then in India. China is rapidly reducing coal consumption as it tries to combat the winter smog , however its clear restricting coal alone is not enough so that means oil is next. Odd or even day use for non electric cars will hamper expected growth for oil. Five million EV charging points are being installed along with permits for IC Engine cars required in Beijing. 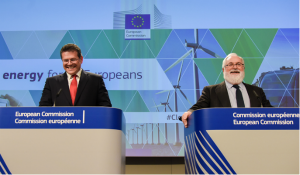 In Europe aspiration laboratory emmision limits passed into law by European lawmakers lobbied by car manufacturers will cease in 2021 when the 50 % excess allowance for new cars exceeding emmissions test limits cease. 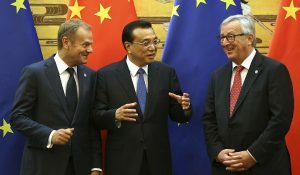 Only in 2021 will the quality of the EU’s official fuel economy and emissions tests cease to be a joke. Fuel economy, emmissions and power for IC Engines. Pick two in the real world and three in the laboratory by fixing the tests. 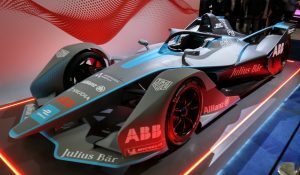 I expect some manufacturers are now contemplating if diesel cars can make real world testing in cold weather conditions beyond 2021 without massive investment if at all. Particularly at temperatures lower than 17C when engine damage might be an issue for cold starts. Others due to past indiscretions may feel IC Engines may never be accepted by the public. VW selling diesel cars in the US is certainly now challenging. Switching manufacture to EV’s as new battery gigafactories around the world drive down costs is simply good business. Will this be before or after 2021? When new research ceases on the IC Engine by car manufacturers peak oil demand will cease to be speculation. It will rapidly become fact. 2021 is going to be a vintage year. Will Trump be a second term President? How many oil companies will by then be branded as ‘Energy’ companies, increasingly trying to scramble in the pass the parcel fossil fuel strandard asset game? $35 costs for five year long term exploration costs in a $50 oil price real world seems about right. Which bank would fund and justify to its shareholders oil exploration projections at $40 plus? Return of capital not a return on capital becomes the issue as the oil glut by low cost producers continues. Cognitive dissonance by oil majors and spread betting by hedge funds. The post 2021 future for the oil market. Just look at coal. I joined a major international oilco out of college in 1965. I was told then about “peak oil” but different terms were used. Every year, the corporate strategic plan update warned about it. But the oil industry exploded over the next 50 years. Nothing in the data in this article is questionable. By the conclusion is. 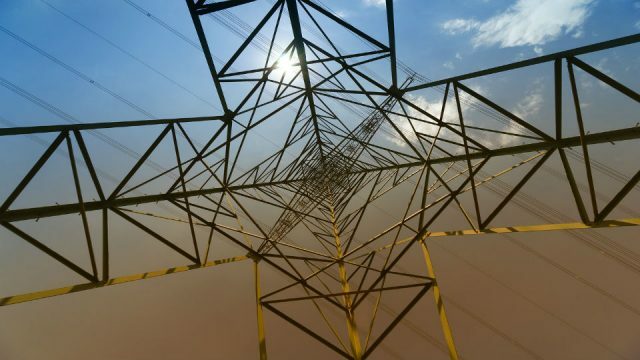 The many technologies discussed throughout the article and implicit as building blocks to an energy future are transformational, and in the past have been generational to actually achieve. I think we’re at least one more generation before we can talk about peak oil. The only source of more solid evidence/speculation is to follow how the major oilcos are actually deploying their capital. That’s the point when they’ve set aside all the data and analysis and made an actual decision about the future. And even then, more time will have to go by before we know if the decision was a good one. I like to look at Chevron’s maybe $60 billion 25 year bet on LNG from Australia’s Northwest Shelf as an example. Cognitive dissonance does not have a long shelf life in the free market. It does seem to last forever in the halls of government, with a little help from lobby groups who continue to tell the emperor that his clothes look awesome. Oil will last as long as there’s a market. Contemplating “buggy whip” status for this industry in the near term seems a little far fetched.